Mary Helen's Blog: PR Disasters! The PR industry basically runs on disasters. Fixing, tweaking, and smoothing over situations is the bottom line of Public Relations. Fineman PR did some research and came up with the top 15 worst PR disasters of the decade..here are the ones I found most interesting..
#1. Bridgestone tire (2000)-Bridgestone is a company that supplies tires to different car manufacturers and beginning in 1998 there were reports that the tires were failing, resulting in hundreds of car accidents and over 200 deaths. This situation wouldn't have exploded if Bridgestone would have admitted that their tires were faulty, but they refused to make any such announcement until 2000 when they were pretty much forced to. The tires were recalled (6.5 million), which was the second largest recall of all time. Just admit your wrongdoings-the public will appreciate it! #2. 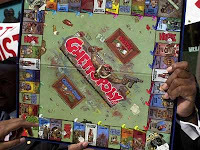 Urban Outfitters sells racist board game-Urban Outfitters is known for its apparel, but theres a section of the store that sells funny trinkets and games, one of which was called "Ghettopoly." Ghettopoly was obviously a play on Monopoly and included cards that said "you got your whole neighborhood addicted to crack! collect $50" and "get rich by pimpin hoes, buying stolen property, and getting car jacked!" This board game caused a huge uproar. Obviously people were offended; very bad move on Urban's part. #3. Jet Blue traps passengers on planes- In 2007, JetBlue had nine flights scheduled to take off from JFK when an ice storm came through, causing the flights to be delayed. You'd think an airline would immediately let the passengers de-board the plane and wait comfortably inside the airport until the bad weather passed, but not JetBlue. JetBlue kept 1,000 passengers on the planes for over 11 hours with little to no food, unpleasant bathroom conditions, and on the runway while an ice storm bombarded the plane. The passengers said it was "horrific." 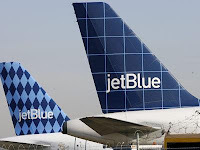 JetBlue eventually saved their name by drafting a "Passenger's Bill of Rights" but only after they viciously defended their decision immediately following the situation. #4. Disgusting Domino's- Social media is unarguably one of the greatest advances of our time with the ability to instantly upload videos to YouTube, however, you might want to think twice about ordering from this pizza joint again. 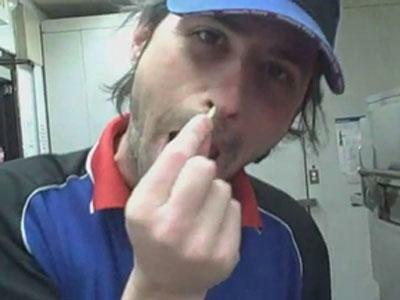 A couple months ago two domino's employees filmed themselves doing REALLY gross things to the food they were preparing (don't eat the italian sandwich again apparently) and then uploaded the video to the web, causing major upset and lots of unhappy customers. This is pretty bad on the employee's part, but what about the company? They waited two whole days before making any sort of statement while the video got 1 million views on YouTube. They eventually issued an apology and fired the two guys but the images people saw around the world aren't going away any time soon. #5. ABC's locker room scene. A year after the Janet Jackson super-bowl fiasco, ABC created a commercial, which aired during Monday Night Football that was high inappropriate for the family-friendly program. Nicolette Sherdian was shown in the men's locker room in only a towel attempting to seduce Terrell Owens. Maybe this would have been humorous if only a year earlier the network didn't receive thousands of complaints about Jackson's, umm, lack of clothing. The FCC was fined for the amount of disappointed fans who called in to complain. Once again, bad move ABC.